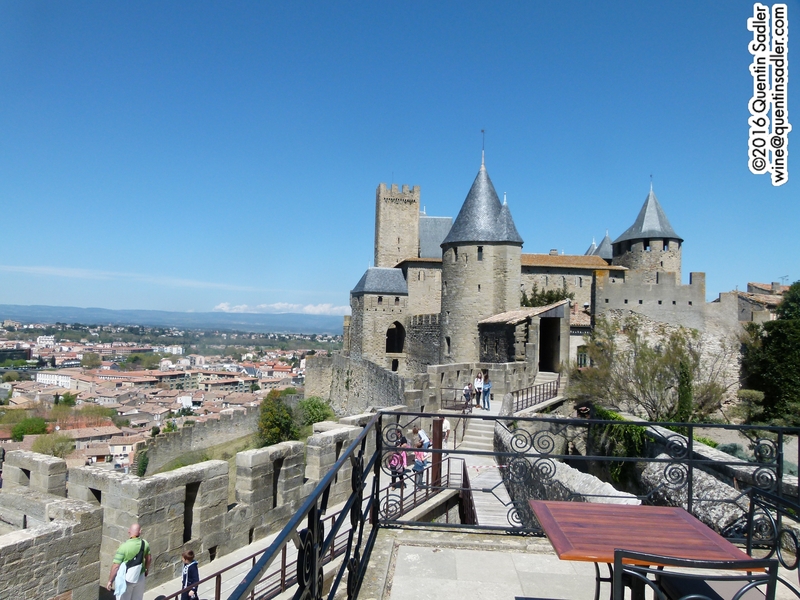 Carcassonne, which was recently my home for a week. 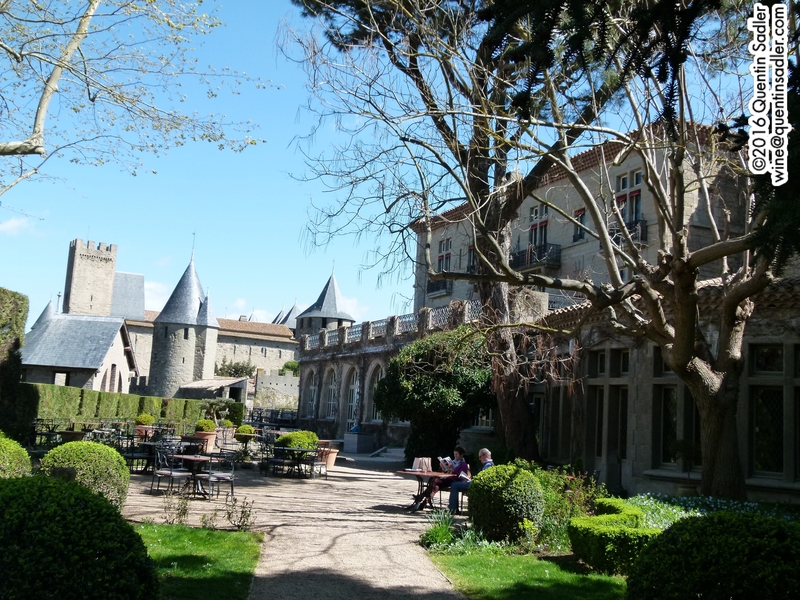 The garden of my hotel in Carcassonne – I have to pinch myself now I am back in blighty. I have recently spent a week in Carcassonne experiencing as many of the different wines of France’s Languedoc region as I could. It was part of Languedoc Week (‪#‎languedocweek‬) and I had a wonderful time and learnt a lot, tasting loads of wines, attending seminars and visiting vineyards with fellow wine writers from all over the world. 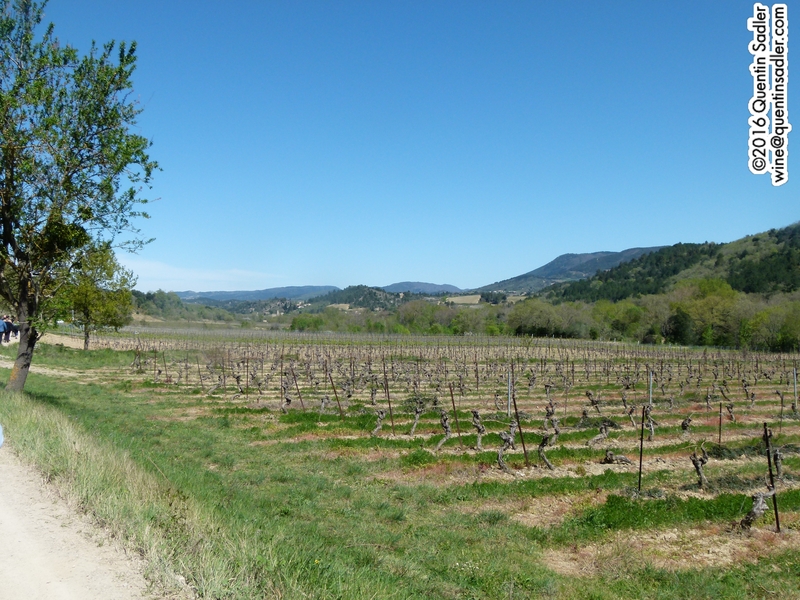 Languedoc is a fascinating place, full of wonderful scenery and many exciting wines. Most wine consumers will have experienced the basic wines from the region, the Vin de Pays d’Oc – the new term is Indication Géographique Protégée / IGP d’Oc and that sometimes appears on the label instead. These are often sold as a varietal bottling, with the grape variety from which the wine is made appearing on the label. 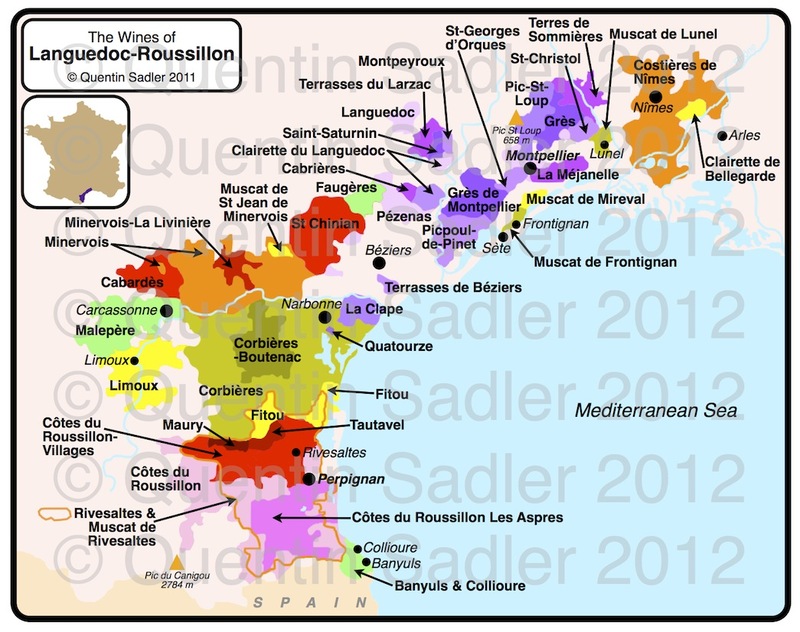 Languedoc is home to a whole clutch of finer, more ambitious and increasingly famous wines as well though. These often have their own Appellation d’Origine Contrôlée (AOC / AC), with the place name being the most important piece of information on the label. The new term for AOC is Appellation d’Origine Protégée (AOP) and that sometimes appears on the label instead. Map of the Languedoc-Roussillon region, Limoux is on the left in yellow – click for a larger view. It is a hot region with a Mediterranean climate, so it perhaps logical that red wines from the likes of AC / AOP Languedoc, Fitou, Corbières, Minervois, and Saint-Chinian are the region’s most famous products, but the Languedoc makes plenty of good whites – Picpoul de Pinet is especially popular right now – and rosés too. There are also some magnificent and under appreciated sweet wines and some excellent sparklings too. After a hard day’s wine tasting, some nice fizz is always a refreshing idea and I was fortunate enough to taste quite a few of the sparklers from the region. I enjoyed one of them so much so that I have made it my Wine of the Week. Blanquette de Limoux is a lovely wine style that I first used to sell a long time ago, but sadly it remains a sort of secret wine beloved by a few, but not really widely available, at least not in the UK. It is thought to be the oldest quality sparkling wine in the world, with records showing that it was produced in 1531 by the Benedictine monks of Saint Hilaire Abbey, some 10 km south of Carcassonne. This predates Champagne and I am sure that, like Champagne, the process was hit and miss in the early days and was not really perfected until the middle of the nineteenth century. What is definitely true is that the wines have got better and better in recent years and now deserve to be much more sought after. The climate here is a bit odd as winds from the Atlantic manage to reach over and temper the Mediterranean heat. This allows for the production of whites and sparkling, especially if they harvest them early and there is even some good Pinot Noir grown around here. Blanquette de Limoux wines must be made sparkling by the traditional method, the same process as used in Champagne. The wine must be made of at least 90% Mauzac grapes, known locally as Blanquette (small white in Occitan, the local traditional language – the langue d’Oc), with Chardonnay and / or Chenin Blanc making up the rest. A light, sweet sparkling wine called Blanquette Méthode Ancestrale is also made, as is another traditional method wine called Crémant de Limoux, which can contain much more Chardonnay in its blend, and I will write about those another day. 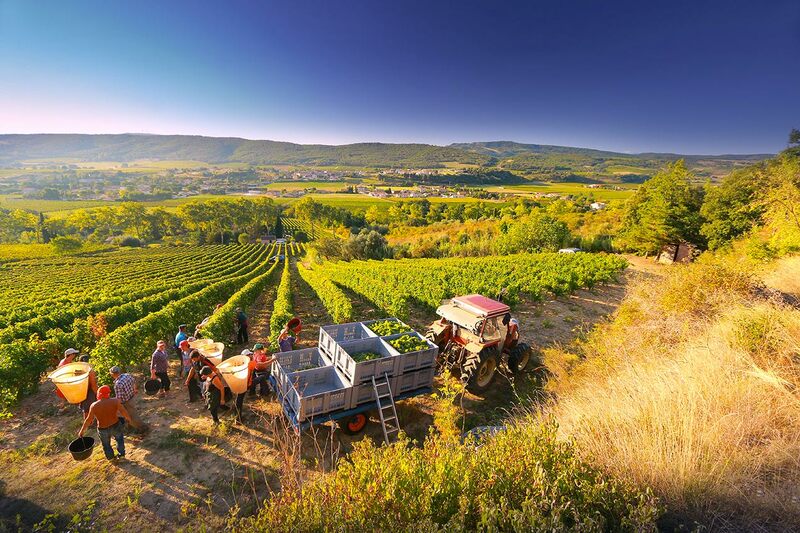 Harvest at Domaine J. Laurens – photo courtesy of the estate. Domaine J. Laurens was bought and totally renovated in 2002 by local businessman Jacques Calvel and although still wines can be made here, this estate only produces sparkling. In my opinion they achieve very high quality by close attention to detail and by longer ageing on the lees than is required. The minimum time for yeast autolysis, ageing on the lees in the bottle, in Limoux is 9 months, but Laurens age their wines for between 12 and 24 months, which gives more complexity and finesse. The blend is 90% Mauzac with 10% Chardonnay. The wine is a pale colour with a fine and persistent mousse, while the nose is fresh, lively and floral, together with ripe apple and pear notes. On the palate the freshness dominates, making it taut and focussed, while there is plenty of green apple and a hint of nuts from the lees ageing together with a little richness of honey and cream. A lovely and lively wine that makes a great aperitif and I am sure it would go with lots of delicate dishes as well. It’s dry, but not searingly so, as there is an underlying softness to the fruit. A distinguished wine and great value too, I cannot think of a better sparkling wine at this price – 89/100 points. Available in the UK at around £13 per bottle from Stone, Vine & Sun, click here for other stockists or check with Boutinot, their UK distributor. If this wine is not easily available for you, then you will almost certainly find a Blanquette de Limoux made by the excellent Sieur D’Arques cooperative near you somewhere – look at the small print on the label. In the UK, Tesco’s Finest 1531 Blanquette de Limoux is made by them and is very good and a bargain at £8.50 per bottle, click here for case sales.